Whenever the winter months approach, people tend to worry more about how to ensure that the winter mess stays outside their homes. In most cases, people use doormats to help alleviate the mess brought by foot traffic but they forget about the mess their vehicles bring to the garage. During bad weather conditions, tires are exposed to dirt and other undesirable mess. This often makes its way to the garage from where it makes it way to the house. Fortunately, you can use garage floor mats that can work in same way that the doormats do to our feet. In this post, we help you identify the best garage floor mats that will perfectly work for your garage. You might consider buying any of the products reviewed below because we have researched and tested them thoroughly for this purpose. If you are planning to buy a garage floor mat that is not only portable but also ideal for your garage, there are only a few to choose from. From the few available, AutoFloorGuard AFGS-7916 is the one we found the best suited for this purpose. It is constructed from heavy-duty polyester scrim commercial grade material that is more durable than the previous models. The commercial grade polyester fabric allows the vinyl to coat and intertwine making it stronger. Moreover, the two materials make it withstand the harshest of day and night weather conditions. This mat features large inbuilt closed cell foam with a containment edge. The polyester fabric gives the mat its strength while the vinyl finish ensures it is waterproof. It is also ultraviolet treated, which makes it resistant to fading and breakdown even at 40 degrees Fahrenheit. It also comes with watertight seams that are heat-welded to ensure it does not mold up. The thermal welding ensures the mat is durable and functions well. What’s more, the seams are designed to meet at the stay-put corners to make sure it does not move whenever it is in use. You simply roll it out and it is good for use. Although this mat is good at keeping the dirt and grime contained, it requires cleaning after every use in order to avoid dirt build-up. In fact, once the dirt builds up, it can make your garage messy and make it difficult for you to alight from your vehicle. This garage floor mat is a product of TruContain, a company that has crafted its reputation in producing high quality and durable floor mat products. With a decade old reputation, TruContain is among the best-known companies that deal in the manufacturing of the best garage floor mats today. TruContain CM7916 garage floor containment mat brings the ultimate containment mat experiences right in your garage. It is manufactured from heavier and stronger foam materials that are thermal-welded with PVC infused materials to create a flexible but strong and durable 1 1/8-inch containment edge. The seams are well welded to makes sure they are watertight. Moreover, they are located underneath the mat, enabling it to keep water away as long as the floor does not become wet from beneath. With the lightly textured surface, you can be sure to have a stress-free cleaning experience. Even with the great features and construction materials, TruContain CM7916 have big bunching problem. This garage floor mat is not always flat. Whenever the car rolls in, the mat is pushed up by its weigh to create a bunching effect. The bunching issue not only disaffirms the containment edge of the mat but also allows puddles to be created where you alight from the car. If you are looking for a permanent garage floor mat, Armor All AAGFm20 Charcoal is the kind of mat you will want to have in your garage. This garage mat is manufactured and certified in USA, meaning that it attains all the required standards. All AAGFm20 Charcoal is manufactured from a lightweight polyester material that is coated with a PVC fabric to make it waterproof. The polyester and PVC materials make this mat extremely durable since the waterproof elements also prevent oil and other chemical substances from soaking through. Armor All AAGFm20 Charcoal is a permanent garage floor mat that is truly comfortable once it is well-installed in your garage. It brings out the same feeling of a carpet or a thick artificial grass. Moreover, this garage mat’s texture provides non-slip qualities for you and your car. This garage floor mat is designed to offer you a stress-free cleaning experience. In fact, you can use a vacuum cleaner, a power wash, or even a hose. What’s more, you don’t need a professional to have it installed. You can install it in minutes by simply rolling it out and adhering at the edges. Armor All AAGFm20 Charcoal also comes with a few drawbacks. One of them is that its cleaning needs more time and effort. You have to clean and vacuum the upper fabric. Moreover, it does not have a containment edge, which means that it doesn’t hold permanently on the floor. BTL focuses its production primarily on flooring requirements and garage floor mats are one of the products it produces to perfection. If you are looking for the best PVC fabric garage floor mat, BTL could be your best pick. Since BTL does not feature polyester material in its construction, it is made thicker than most of its competitors to enhance its durability and strength. Even though the PVC material may bring a bit of problem, the fact that it is thicker and permanent makes up for that problem. Additionally, BTL is better suited to handle hot tires that result from fast and longer drives, especially during hot days. It is also designed to be water and stain proof; it comes with a stain blocking top coat. The PVC fabric also enables the garage floor mat to withstand the harsh automotive liquids, chemicals, and debris. It is even more difficult to clean due to its ribbed construction. Typically, the ridges are effective at trapping dirt and water thus making its cleaning a time-consuming job. Moreover, the lack of raised edges will only accelerate the problem of washing because you will end up cleaning the garage floor as well. If you are looking for a garage floor mat that features a high-quality construction and material used, then Garage Mat Express gives you what you ask for. As a new brand in the market, it mainly focuses on offering the best in terms of garage floor containment mats. This floor mat features high-quality PVC coated material that gives it strength and durability that you need in a garage floor mat. Its seams are heat-welded to ensure the containment edge is watertight as well as durable. 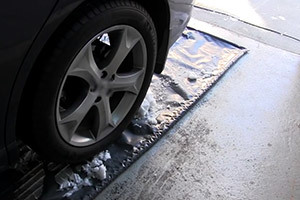 This mat offers you the ability to protect your garage floor against all manner of dirt that comes embedded on your vehicle’s tires, especially during winter months. The PVC coating not only provides waterproof properties to this mat but also makes it withstand the high temperatures that result from long hours of drive particularly during the hot days. Garage Mat Express offers a stress-free set up in your garage. You simply roll it over and it is good for use. You don’t have to worry about fluids leaking and staining your mat or underneath floor mat, not even snow or dirt being tracked into your house. This mat will protect your garage against all these. When it comes to cleaning this mat, it is super easy. It doesn’t need much of your time and effort. Just wipe the dirt, snow and other debris off its surface and rinse it with clean water. What’s more, you can roll it up and take it outside to dry. Those are among the benefits that come with Garage Mat Express containment floor mat. On the negative side, this garage floor mat is not permanent. As such, it might have issues of creating puddles and moving whenever you are parking or leaving the garage. Although you will only find a few garage floor mats in the market, there are a few things that you need to look out for in each garage floor mat before spending your money on a mat to ensure you get value for your money. Garage floor mats come as either portable or permanent. The choice you make here depends entirely on how you use your car. So, what is the difference between these two types? Portable: This is the most common garage floor mat and can be rolled up and carried to another location then unrolled again. What makes this type common is the fact that it is inexpensive and requires less effort to install. It is also easier to clean as compared to a permanent one that you clean like any other floor in your home. However, the drawback is that it is not as strong and durable as permanent floor mats. Individuals with lighter cars, however, won’t have as many issues using the portable as those with heavy vehicles. It is also important to note that the heat from the tires can bring problems, especially if you drive for long hours every day. Permanent: This type can possibly be removed, but it is generally treated as the floor. It comes with a thicker, larger, and heavier design as compared to portable types of garage floor mats. However, if you invest in permanent garage floor mat, it will last twice as long as the portable ones. This makes it more expensive in terms of installation time, effort, and the cost of buying. If you would like to move it, this might prove to be difficult. The permanent garage floor mat does well when dealing with light and standard SUVs and trucks. Depending on your preferences and needs, you can pick the type of garage floor mat that suits you. The kind of material used on a garage floor mat plays a substantial role in determining to what extent the mat will hold. Fortunately, most of the mats feature plastic material with only a few coming with different material types. You can choose a mat from two types of plastic materials: vinyl and polyester. Each of the materials seems to hold up well to compression and heat. Vinyl: Despite the fact that most garage floor materials are made from polyester materials, there are some that come with vinyl. Vinyl is a less expensive material that offers excellent waterproofing qualities. It also has a low reactivity to chemicals that are regularly used in the garage. It is easy to clean. The main drawback for vinyl is that it is not a strong and durable material when used on its own. This explains why it is complemented by polyester in most cases. Polyester: The initial garage floor mats were wholly made of polyvinyl chloride (PVC). However, PVC proved to be very weak on its own. As such, you will need a really thick PVC garage floor mat to guarantee durability. To develop a stronger and less expensive mat, manufacturers utilize polyester in the manufacture of a garage floor mat. Polyester is a stronger material as compared to vinyl and is constructed in various ways to make a floor mat. Covering polyester with PVC results in an even stronger garage floor mat. Even though non-woven polyester offers a better seal, the woven one is much stronger. The other important thing to look when buying a garage floor mat is its seams. This is because they often determine the extent to which your mat lasts. Polyester and vinyl materials are not as likely to rip as compared to the seams. However, they can help alleviate the problem of ripping when constructed appropriately. The seams can be heat-welded so that they don’t split once you install the mat. Apart from welding, you can also alter the location of the seams. Most manufacturers put the seams beneath the floor mat while others have different positions with the main aim of protecting them from splitting. Why Buy a Garage Floor Mat? The benefits of having a garage floor mat are often overlooked when it comes to the safeguarding or improving the face of a garage floor. If you didn’t know how you could benefit from garage floor mats, check out what a garage floor mat brings to your garage. Although this is a clear function, the best garage floor mat will protect your floor better as compared to some of the coverings you use. The mats are stain, oil, and chemical resistant and can withstand the harshest of abuse if your garage doubles up as a workshop. They are also waterproof, implying that it will protect your floor against damage from road salts and freeze-thaw during winter months. During winter months, water or snow can collect on your garage floor to create a slippery surface. You obviously know what will happen if you walk on slippery floors. Most garage floor mats are anti-slip and once rolled out, they can effectively eliminate the slipping effect during winter months. If your garage floor is old, it has probably gathered a generous portion of stains and unsightly cracks over the years. Rolling out a good garage floor mat can help hide such flaws temporarily before you fix them. You don’t need floor prep, simply roll out the mat and see how they disappear. Garage floor mats are constructed in a manner that makes them easy to clean whenever they become dirty. You can do away with the oil spills and collect the grime and dirt with a dust mop easily. Owing to the nature of concrete garage floors, debris from your garage floor could make its way into your living room easily. Even if you keep the it clean, the concrete dust and small particles can always find their way into your home. Rolling out a garage floor mat, however, will put an end to this problem immediately. This is because you will only need to clean the debris that is on the surface of the mat without creating other from the porous concrete floor. Due to its glossy and attractive finish, a garage floor mat can significantly brighten up your garage, making it more appealing both day and night. You can transform your dull and boring garage in minutes with a good-looking floor mat. Although you might find a number of garage floor mats types, there are many different circumstances to utilize them. Depending on your needs, you might find one floor mat better suited to your garage than the other is. By following the tips that we have provided in the buyer’s guide above, you too can get the best garage floor mat for your garage. You can also subscribe to our blog to receive notifications on other products that will be available soon.